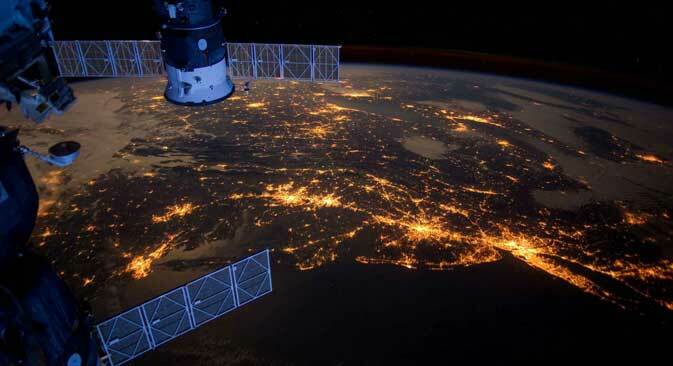 Earth: a view from the ISS. Scanning the territory of potential military operations from space has become a crucial element of campaign preparation. Russia now fields one of the largest and most effective satellite groups in the world, and it has reached a peak of activity amid the military operations in Syria. Satellites saw extensive military use in the past, but the spread of high-precision weapons and the appearance of other advanced military technology has exponentially boosted their role today. The Syrian campaign is the Russian military space forces’ most extensive deployment since Soviet times. The details are largely classified, but some facts are known about how these eyes and ears on space are shaping and advancing the ongoing operations in Syria, where satellites are being primarily used for reconnaissance – but not only. Even before the Russian military operations began, a constellation of several dozen satellites extensively logged the entire combat area from the skies over Syria, pinpointing the Islamists’ fortifications and main communication routes. However, beyond the traditional use of satellites, another important aspect came into play. Satellites can now aim precision weapons, fixing targets while calculating the topographical specifics of the area and transmitting data to the computer that directly controls individual missiles. Russian satellites also monitor the skies over Syria and the surrounding coastal waters. While it seemed excessive at the beginning of the campaign, this depth of cover has paid off: The surveillance includes the Turkish-Syrian border, which became a focus of attention of the Russian command after Turkey’s downing of a Russian Su-24 bomber on Nov. 24. Over the past 15 years, Russia’s military space forces have been extensively upgraded, as shown by cardinal improvements in the range of satellites in service. While earlier models were bulky units that transferred images of the ground in special capsules jettisoned from orbit, the technology has raced forward since the early 2000s. The defense industry developed and launched a new series of satellites called “Person” that replaced the Soviet-developed Neman satellites. Person also produced an offshoot called “Cobalt.” But since it was designed to spend less than a year in orbit this model was not compatible with the normal launch schedule of Russia’s carrier rockets, and its usage disrupted the updating of the space group and prevented the full flow of data from orbit. The Person ("Persona") satellite. Source: Press photoBy contrast, the general operational lifespan of the Person is up to seven years. While the satellite still has a large mass, its contents are much more efficient than those of its predecessors. The onboard optical digital camera provides clear pictures of the surface and can detect and record images of objects only 12 inches (30 cm) wide. And recorded data is no longer relayed to the ground in a capsule but via a special radio channel. The space forces also commissioned the design of the Lotus-S satellite for electronic reconnaissance, replacing the Soviet-era Celina model. The Celina was far from obsolete but politics ultimately determined its fate, since the satellite was produced by the Ukrainian company Yuzhmash. However, the Russian military’s final severance of ties with the enterprise happened before the outbreak of the 2014 crisis in Crimea and the Donbass. Meanwhile, work continued on a major project to create a new satellite communications system for the Defense Ministry and Russia’s main intelligence directorate. Satellite types like the Meridian and Raduga (“Rainbow”) link up navy ships, submarines, aircraft and ground units. The Raduga satellite. Source: Press photoBut as integral as they are to Russia’s military capabilities, these models are also designed for parallel use in the civil sphere, notably to create a dense communications network in northern Siberia and the Russian Far East as part of plans for the economic development of these regions. QUIZ: Would you make a good artilleryman?